Three sizes (small, medium, and large) in both right and left handed versions. To determine which size is appropriate for your hand, see the Handshoe Mouse sizing chart. Three colour options: black, white, and clear (only black and white currently available). 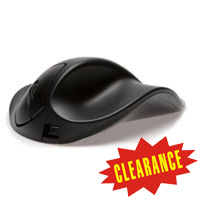 Reduces Hand and Arm Fatigue - The Handshoe Mouse's design requires that the user's work surface be large enough to allow full movement of the arm when moving the mouse while the arm rests on your desk. It is important to use this mouse with your arm resting on the work surface, since the mouse should be moved primarily by arm movement and not hand or wrist movement. In this way, both hand and arm can be used most advantageously, thus reducing any excessive fatigue generated from improper or ill-advised hand and arm movements. Consequently, proper use of the mouse is just as important as proper positioning of the hand on the mouse, since it is both these aspects in conjunction that will give maximum benefits to the user. By transferring much of the force required for mousing to the stronger muscles of the arm instead of the weaker muscles of the wrist or hand, the overall workload can be distributed in the most economical and ergonomical way. 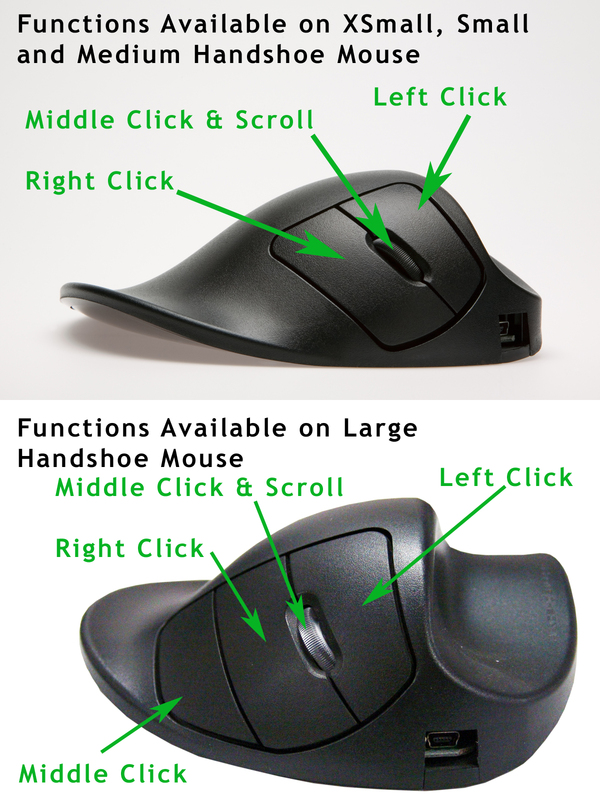 Three sizes for both left and right hands: Because the Handshoe Mouse is designed to fit your hand, it must be able to Accommodate different hand sizes and come in both a left and right hand version. Thus there are six different mice models available, with hands sizes (left and right) corresponding to hands measured from the tip of the ring finger to the wrist crease in large (210 mm or 8.25"), medium (190 mm or 7.5"), and small sizes (170 mm or 6.75"). Note: we currently stock right-hand sizes only - left-hand sizes are manufactured on demand and cost up to four times the amount. To determine which size is appropriate for your hand, see the Handshoe Mouse sizing chart. Three colour options: The Handshoe Mouse is available in white, black, or transparent colours (current stock is only available in white or black, however). Wired and wireless models: In order to Accommodate the widest range of working environments possible, there are both wired and wireless versions of the Handshoe Mouse. The wired model has a cord that plugs into your computer at one end (standard USB port) and into the mouse itself at the other end (smaller USB port). The wireless version's batteries can be recharged using the USB cable. Rechargeable battery: The Wirelss version of the Handshoe Mouse uses a rechargeable Lithium battery. Battery life will vary depending on usage, number of recharges, etc. It is generally best to wait to recharge until the blue LED shows via the Scroll Wheel, indicating that the battery is getting low. Generally a 3-hour charge will return the battery to maximum capacity. Variable weight: The weight of the Handshoe Mouse can be lessened slightly by removing metal weights housed in the interior of the mouse. The weights located in the outer chamber in the underside are specifically there to allow the user to reduce the weight of the mouse. Research by Hippus NV determined the pivot weights for the various sizes, although they do not actively promote this feature of the mouse. However, if some users prefer a slightly lighter mouse, then it is very easy to just remove a few weights.